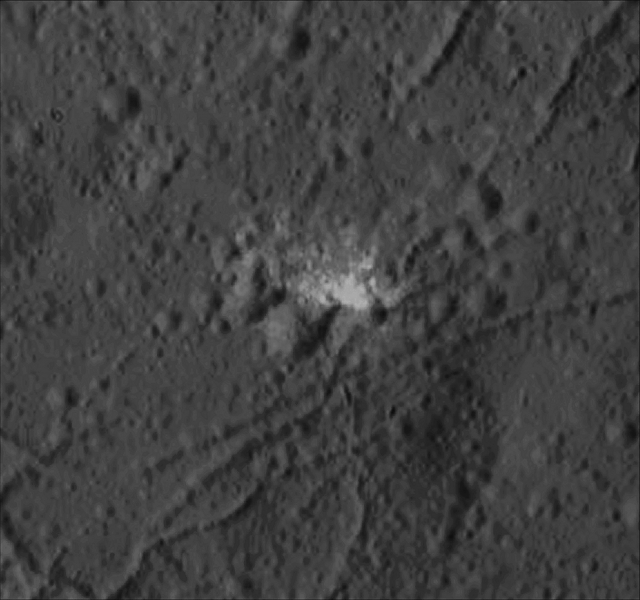 Today's APOD is an Extra Detail Magnification (or "EDM", for short) of yesterday's Contextual Image (or "CTX Frame", for short) of the Dwarf Planet 1-Ceres, taken by the NASA - Dawn Spacecraft on December, 21, 2015, which showed us part of the Floor of Dantu Crater, and that revealed Surface Structures hinting (---> suggesting) at the occurrence of Tectonic Processes that, in a very remote past, formed and defined this Dwarf Planet's Surface. As you can see, some sort of semi-Linear Surface Structures (---> in fact, they are small and relatively shallow and intricated cracks) are spread almost all over the Crater's Floor while, on the other hand, outside the Crater's Rim (not visible neither in this EDM, nor in yesterday's CTX Frame), the presence of these Linear and semi-Linear Structures continues in the form of Scarps (---> Linear and semi-Linear, Cliff-like Slopes) and Ridges. However, similar Fractures are seen in Tycho, one of the youngest large Impact Craters on Earth's Moon. This cracking may have resulted from the cooling of Impact Melt, or when the Crater's Floor was uplifted after the Crater formed. The focus here, however, and probably it is useless to say it (but we wnat to underline it anyway), is on a relatively large and irregularly-shaped White Spot that is clearly visible - at center frame - near a truly small Crater Cluster. Dantu Crater's diameter is roughly 78 miles (such as about 125,528 Km). Just as usual for 1-Ceres, a number of White Spots (some truly well defined and clear) can be easily seen inside, on the steep Inner and Outer Rim, and also outside Dantu Crater. The original photo was taken during its Low-Altitude Mapping Orbit (or "LAMO", for short) and from an altitude of approx. 240 miles (such as about 386,2416 Km) from the Surface, with a resolution of roughly 120 feet (such as about 36,576 meters) per pixel. This image (which is a crop obtained from an Original NASA - Dawn Spacecraft's b/w and NON Map-Projected frame published on the NASA - Planetary Photojournal with the ID n. PIA 20193) has been additionally processed, extra-magnified to aid the visibility of the details, contrast enhanced and sharpened, Gamma corrected and then colorized (according to an educated guess carried out by Dr Paolo C. Fienga-LXTT-IPF) in Absolute Natural Colors (such as the colors that a normal human eye would actually perceive if someone were onboard the NASA - Dawn Spacecraft and then looked ahead, towards the Surface of 1-Ceres), by using an original technique created - and, in time, dramatically improved - by the Lunar Explorer Italia Team.